SHELTERED in the Cornish coast was the hiding place of a band of tender-hearted pirates. Never was the trade of the skull-and-cross-bones followed by men of such sensitive and compassionate feelings. They made it a point of honour never to attack a weaker party, and whenever they attempted to fight a stronger one they invariably got thrashed. Orphans themselves, they shrank from ever laying a molesting hand on an orphan, and many of the ships they captured had to be released because they were found to be manned entirely by orphans. Little wonder was it that these Pirates of Penzance could not make the grim trade of piracy pay. The curtain rises on a scene of revelry. Frederic has just completed his pirate apprenticeship and is being hailed as a fully-fledged member of the gang. That he had been indentured with them at all was a mistake. When he was a lad his nurse was told to take and apprentice him to a pilot, and when she discovered her stupid blunder she let him stay with the pirates, and remained with them herself as a maid-of-all-work rather than return to brave the parental fury. Frederic, at all times the slave of duty, has loyally served out his time, but now he announces that not only will he not continue at a trade he detests, but he is going to devote himself heart and soul to his old comrades’ extermination. The declaration turns the camp from joy into mourning, but these very scrupulous pirates have to admit that a man must act as his conscience dictates, and they can only crave that the manner of their deaths may be painless and speedy. Frederic has never seen a woman’s face – no other woman’s face, at least, but Ruth’s, his old nurse, who adores him – and thus there come as a vision of loveliness to him the figures of the many daughters of Major-General Stanley. They have penetrated into the rocky cove during a picnic. Frederic, sensitive about his detested dress, hides from them for a while, but soon he reveals himself and entreats them all to stoop in pity so low as to accept the hand and heart of a pirate. Only one of them, Mabel, is ready to take him for what he is, and the love-making between the two is swift and passionate. It is interrupted by the return of the gang, each member of which seizes a girl and claims her as his bride, and during this lively interlude there arrives old General Stanley. He has lagged behind the rest of the party. The General, a resplendent figure in his uniform, knows a good deal about the most abstruse and complicated sciences, though he proclaims that he knows no more of tactics than a novice in a nunnery. In this he holds himself to be “the very model of modern major-general.” Completing the candid recital of his attainments and want of them, he inquires what strange deeds are afoot, and he has no liking either for pirates as sons-in-law or for the prospect of being robbed wholesale of his daughters. But where is the way of escape? Luckily the General has heard of these Penzance pirates before, and he wrings their sympathy with the sad news that he, too, is “an orphan boy.” For such tender-hearted robbers that is enough. They surrender the girls, and with them all thoughts of matrimonial felicity, and restore the entire party to liberty. The second act is laid in a ruined chapel at night. General Stanley, surrounded by his daughters, has come to do penance for his lie before the tombs of his ancestors, who are his solely by purchase, for he has owned the estate only a year. Frederic is now to lead an expedition against the pirates. For this perilous mission he has gathered together a squad of police, who march in under their sergeant, all of them very nervous and under misgivings that possibly they may be going to “die in combat gory.” Soon after they have left there is a whimsical development. Frederic, alone in the chapel, is visited by the Pirate King and Ruth. Covering him first of all with their pistols, they tell him that they have remembered that he was born on the 29th of February, and that as he thus has a birthday only every four years he is still but five years of age! Frederic, as we have observed before, has a keen sense of duty. In blank despair he agrees to return to the gang to finish his apprenticeship. Once more a member of the band, he is bound also to disclose the horrible fact that the old soldier has practised on the pirates’ credulous simplicity, and that in truth he is no orphan boy. The Pirate King decrees that there shall be a swift and terrible revenge that very night. When all have left but Mabel, who declares that she will remain faithful to her lover until he has lived his twenty-one leap-years, there re-enter the police. The sergeant laments that the policeman’s lot is not a happy one. It is distressing to them to have to be the agents whereby their erring fellow-creatures are deprived of the liberty that everyone prizes. He loves to lie a-basking in the sun. Sounds are heard that indicate the pirates’ approach. The police conceal themselves, and soon the intruders enter, armed with all kinds of burglarious tools, and with a cat-like tread (they say so, at least, though they are singing their loudest). They are interrupted, not by the police, but by the appearance of General Stanley. He has had a sleepless night, the effect of a tortured conscience, and he comes in in a dressing-gown and carrying a light. Soon his daughters also appear in their night-caps. The General is seized and ordered to prepare for death. Frederic, even on Mabel’s entreaties, cannot save him, for is he not himself a pirate again? Eventually the police, having passively watched the situation so long, summon up courage and tackle the pirates, but they are soon overcome. The sergeant, who with the rest of his men is held prostrate under drawn swords, then calls upon the ruffians to surrender in the name of the Queen. The command acts like magic. Loyally the pirates kneel to their captives, for it transpires from Ruth’s lips that they are really “no members of the common throng ; they are all noblemen who have gone wrong.” All ends happily. 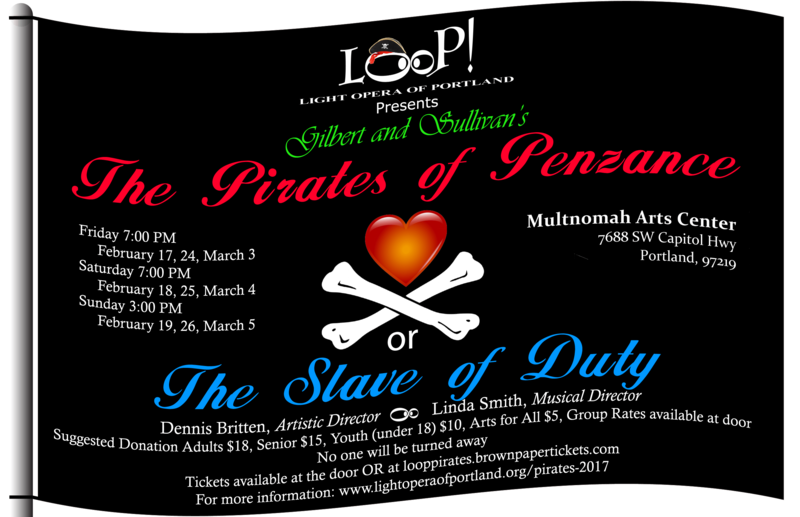 The Pirates of Penzance promise to return forthwith to their legislative duties in the House of Lords and, in doing so, they are to share their coronets with the beautiful daughters of old General Stanley.